Home › Government Failures › Rockefeller admits he is part of a global conspiracy. And is proud of it. Let’s chat oh so briefly about David Rockefeller and capitalism. You don’t, and won’t, hear much about him, but he explains that in one of his quotes below. First, capitalism. We don’t have capitalism. Capitalism is a free market of competition where companies cannot secure protection from domestic and foreign competition, preferable legislation and agreeable taxation from their own Government, usually accomplished through billions spent in lobby money, campaigns backed by union member dues, backdoor deals, regulatory capture (definition below), horse trading and promises (like jobs at particular companies, think tanks, consulting gigs, non-profits, government agencies, etc…) in the future for deals cut today. What we have today is crony-capitalism aka “Corporate Fascism,” as Mussolini called it. A “partnering” of private corporate businesses (including the banks) and Government. Each patting the back of the other, exchanging favors, protections, money and power. Capitalism is what we had that created the highest standard of living and wealthiest middle class in the world in less than 150 years before the corruption and greed of Government partnering with the Banks and Corporations came along starting in 1913, creating trillions in debt, destroying our purchasing power and our incomes with inflation and strapping future generations with the bills of the bailouts of the past. And why? Because a fat rabbit draws the jackals. Banks are robbed because that’s where the money is. When you do in 150 years what Europe could not do in 2,000 and create the wealthiest middle class the world has ever seen – you invite the predators to skim off that wealth by controlling the information, the education, the economy, the money and the banks. That is where we are today. It’s time to wake up to the truth. 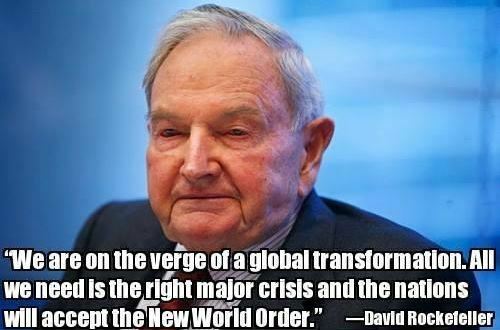 And when Rockefeller mentions below the need for “another major crisis”…what do you guys think that will be? A false flag attack? Or could it look like this? Regulatory Capture – where the Government needs to “regulate” an industry and since Government is just a bunch of black suit politicians built for the single purpose of getting re-elected, they have to hire consultants from the very industry they are attempting to regulate. In other words, the corporations become politicized and now become the wolf seeking to guard its own hen house. So is it any wonder why it becomes so easy for corporations to negotiate and cut deals and secure protections when THEY become THEIR OWN regulators? This is crony-capitalism. ‹ How the hell would private roads work you idiot?